Cosmetic dentist Dr McAree believes his industry is fast-paced, with advances in techniques and technology offering new treatments for patients. At The Whyte House we will believe in conserving your teeth safely and professionally, whilst enhancing their appearance to provide your desired results. Teeth Whitening is by far the most popular cosmetic dentistry choice and an excellent way of revitalising the natural look of teeth, without the need to remove healthy enamel. Teeth can become discoloured over time either as part of the natural ageing process or as a result of staining from extrinsic factors, such as tea, coffee, red wine and smoking. We offer two main teeth whitening choices: Zoom!®, which is carried out in the dental chair and can achieve a brighter result in just an hour; and home whitening, which you do yourself using custom-made clear gumshields. For best results, many of our patients opt for a combination of the two systems. Many patients come to Cosmetic Dentist Dr Grant McAree, concerned about gaps or crooked teeth, but think their only option is ‘train-track’ braces, which they feel they’re too old for. But this isn’t the case. There are two great new alternatives to fixed braces: the Inman™ ‘Speed Brace’ and Invisalign® ‘Invisible Braces’. If just one or two teeth need to be moved, we can also fit custom-made clear aligners. 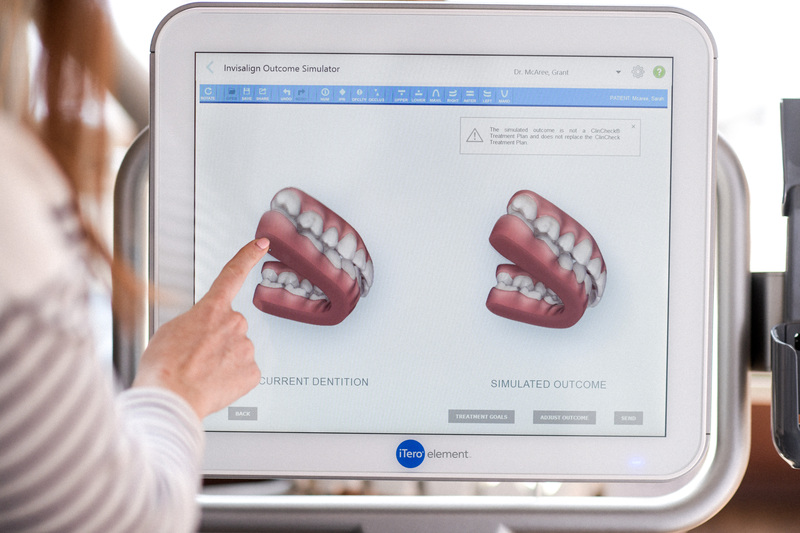 Inman™, Invisalign® and the clear aligners all make use of innovative design, applying precise, gentle pressure to move teeth, usually much more quickly than fixed braces – in months, if not weeks, instead of years. Cosmetic fillings aren’t just for filling cavities or replacing old silver amalgam fillings, but can be used to build up and aesthetically restore teeth, to fill in minor gaps and renew dark teeth. It can produce quite dramatic improvements whilst still offering what is frequently a more affordable option compared to other restorative treatments. They also represent a minimally invasive option, with less of the natural tooth generally having to be removed. Cosmetic Fillings now come in a wide range of shades and degrees of translucency, meaning they can be readily matched to the natural tooth. They also reflect the light in the same way as tooth enamel, again helping to make them look natural. Many of our patients want minor changes to their teeth, but worry about having them cut down to points. Veneers represent a minimally invasive procedure, forming part of our ethos of conservative dentistry – very little tooth surface to be taken away and in some cases, none at all. Crowns are the ideal dental restoration for broken or severely worn down teeth, or ones weakened by decay or large fillings. They can restore the shape and function to teeth that are too severely damaged for cosmetic fillings to be suitable. A crown (or ‘cap’) is a tooth-shaped covering which fits over a badly decayed or broken down tooth or dental implant. It can improve both the strength and appearance of a tooth. The tips of the teeth can have a translucency which makes them look natural-looking, which is down to the skill of our Master Ceramicist and cosmetic dentist. Dental bridges can be a great alternative to dental implants or dentures. For example, if the teeth either side of the gap are badly broken down or weakened by decay or large fillings, a bridge not only fills the gap, but also treats the teeth either side in the process. A bridge replaces a missing tooth or teeth by using the teeth either side of the gap as anchors. It is fitted into place, so cannot be taken out and should not be confused with dentures. Dental implants are the most advanced way to replace missing teeth permanently. They can be used to fill gaps, with a crown or dental bridge, or to hold loose dentures in place, known as implant-retained dentures.